Tell me about your color choice, why'd you pick it? No blue available in the US, and my FZ1 was blue, so I wanted something different. Definitely an all black kind of guy myself. Had my mind set on the back one from the first time I saw it. I still think the black looks better, but the grey one has more personality, IMHO. This bike has personality, so it works. When I got to the dealer all they had was one grey. He told me I could wait four days for a black one or take the grey and he'd knock $300 off. F* it. I'm not leaving with out one, so grey it is. I figured I can always paint or powder coat the wheels if Ii get tired of them. I still see the black ones and think "damn! that looks good." But then I go look at the grey one and I love it. Either way, it's great looking bike. I can't wait to see a Black or Blue one with Fluorescent wheels. 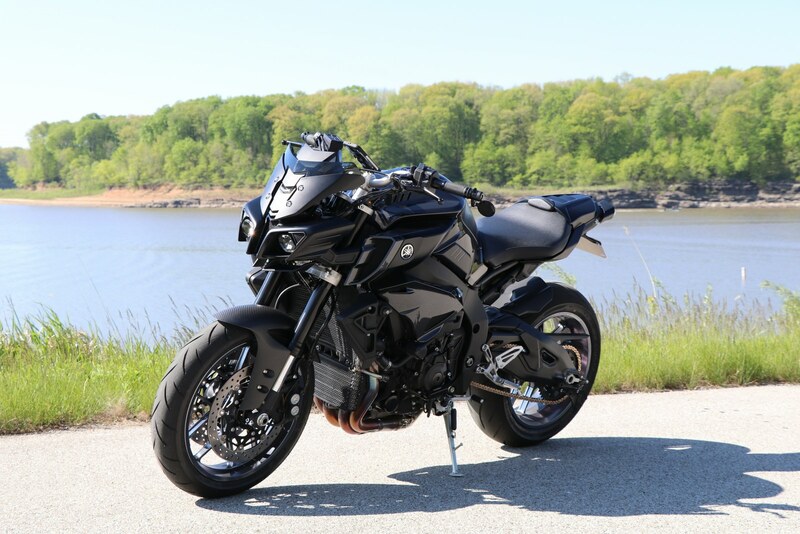 I have a black FZ-10 and dam it is black. Without good lighting, it's just a black blob in pictures. I think black bikes look nice and sleek but I personally prefer brightly colored bikes which is pretty ironic because all the bikes that I've owned were black or white. When I was shopping for a new bike I wanted a yellow 2009 R1 or the Aprilia Tuono Factory cuz those paint schemes are sick. I think the blue for MT-10 is a nice shade of blue but I don't think Yamaha designed it very well with the silver. I was kind of disappointed with the color options for FZ-10 at first but its a pretty minor complaint because of how it rides. Kind of interesting how your dealer only gave you $300 off. My dealer only had the black one at the time and they gave me $500 off the MSRP for mine. When I was looking at the FZ-09 they were willing to take $1200 off MSRP. I'm getting the all black model, not a huge fan of the yellow wheels yet but they are growing on me! Yea, I love the black but it's almost too black. Mine was actually priced below MSRP to begin with and I got a $200 track day with the bike as well, so I'm not complaining. I think black with the yellow wheels would look pretty sick. To me, no question to go with the black. The yellow wheels were a deal breaker for me, way too flashy and over the top. I want a red one. Maybe for model year 2018? I really like the gray...which is why I bought one! The strange thing is that 99% of the time I go with all-black everything. I love the black-on-black look on bikes, cars, trucks, whatever. And if it's matte, that's a bonus. That being said, when I saw the 10's (U.S.) color choices, I immediately wanted the gray, but can't really explain why. Think I was drawn to the wild fluo wheels and bondo-looking gray because it was just not my normal color choice. No doubt it is unique, but then again, so is the 10 in any color really. I do like the black color too, but I don't like red, so that was an issue for me. Gray it is then! Anyway, as crazy as this may sound to some folks, I do plan to introduce another color to my gray 10...leaning towards blue. So yeah, my 10 may end up with a black-gray-fluo-blue color scheme. Hmmmm, will have to start small, see how it turns out...haha. This could have been a quote from my own mouth. If you told me a year ago I'd be riding a bike with fluorescent yellow wheels I would have laughed at you. I like the yellow wheels...I just do not think I would like all the work to keep them clean. Actually, they clean up pretty easy. I love my Black Betty!! I removed the red decals and the front rotors. I will be removing the red shock spring next year. The rearsets will get replaced this year when woodcraft gets theirs released. I like the grey accents on the bike so I went with after market Titanium Grey Wheels. She is Beauty and Beast all in one!!! Black because that was the best deal at that moment. I spent the last 10 years cleaning the brake dust off Orange wheels on my Buell XB12S. Black hides all that. Plus all other rides are murdered out! That's just me. I got the black, a buddy of mine does vinyl wrapping. 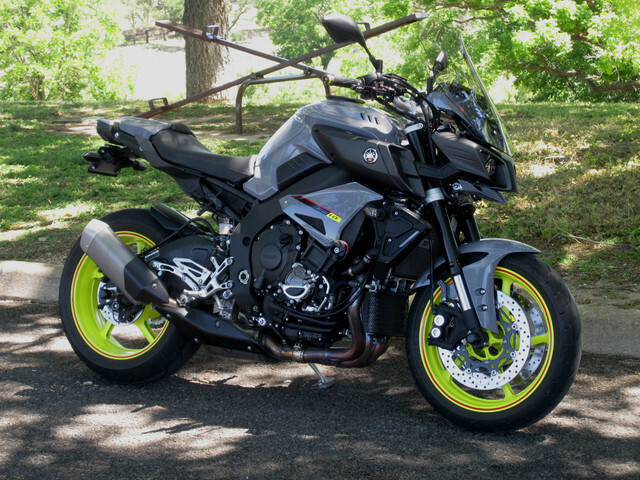 Kinda tempted to do the fz10 SP color scheme eventually. Not a fan of black vehicles....cars or bikes. Black cars are a hassle to keep clean and then you get the swirls in the finish....not for me. Owned one many years ago and swore I would never own another. Black bikes aren't that bad to keep up but they never look that great to me as many of the lines are lost when everything is black, especially when there is no chrome or little bright work to liven things up. Plus I just don't like matte/satin finishes. 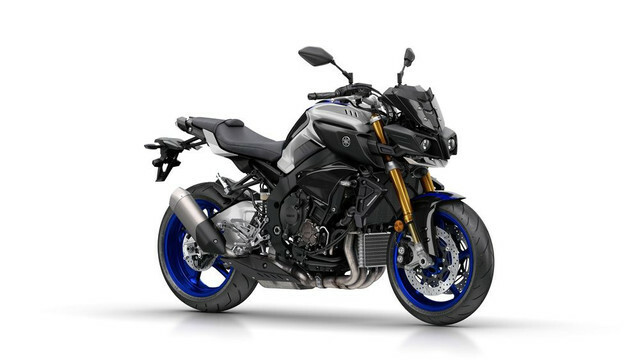 Yamaha first came out with the Armor gray/fluro wheel look with the 2016 FZ-09 and FZ-07. I first saw an FZ-07 in gray over a year ago and it was a knockout compared to the Raven (black) version that was sitting alongside. It was just so outrageous....a battleship gray tank and fender with the brilliant yellow fluro wheels. So when the FZ-10 came out I was just fine with the Armor gray setup. I think it looks very sharp and purposeful.....like it has a mission in life. I test rode a new FZ-09 and a FZ-10 back to back and although I could have been persuaded to opt for the FZ-09 I just wasn't interested in an all black bike, even with a hefty discount. Many riders just like black bikes which is why you see many cruisers in the all black theme, including their riders who almost always wear black including black helmets. I just like a bike that is more colorful, so the FZ-10 fits me perfectly. I also wear a colorful HJC RPHA 10 Lorenzo Graffiti or Bell Qualifier DLX 'Isle of Man' helmet, both of which are very much 'out there' from a design angle. Anyway, it's all good, whether black, gray or blue the performance is the same. Whatever makes you happy. I chose grey because of the contrast and waited around for it. It was hard to see any definition in the pics on the black bike because everything is the same color. 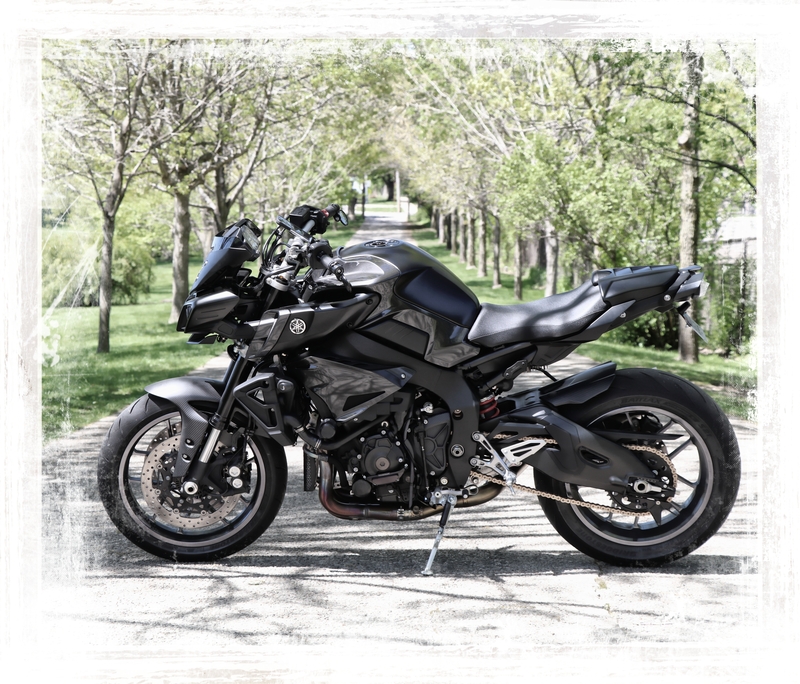 However...a lot of photos I see make it look like the black, especially the side panels, is more a dark graphite and there is a subtle contrast between the rest of the bike and I think it looks sharp. I haven't seen a black bike in person so I don't know this to be fact. I do definitely want to swap the fluorescent wheels for black. Would definitely be willing to trade with a member! I like both of the colors schemes, and I bought the black one. If I had a choice I would have gotten the color scheme of the FZ-10 SP! I love it!